Published in 1895 and composed a year earlier, this setting of the Ave Maria for mezzo soprano and organ comprises forty-three bars of lilting andante and dates from a time when Fauré was at a crossroads in his career. 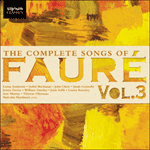 By rights, Fauré should have been appointed professor of composition at the Paris Conservatoire in 1892, but a reactionary faction declared Fauré ‘dangerously modern’. So Fauré was promoted sideways into ‘quality assurance’ and became inspector of conservatoires in the French provinces. 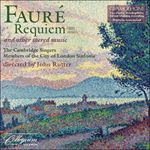 This entailed much travelling and took Fauré’s attention and energy away from composition, while at least providing him with a regular income. 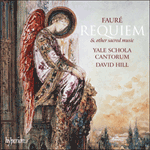 This Ave Maria shows that Fauré could compose anytime, anywhere; but it also shows that the composer’s rare gifts were only truly in evidence when he was intellectually engaged as a performer and shaper of young minds. Needless to say, such times were not those when Fauré was employed as an educational functionary. Despite his long years as a church organist, Fauré was never an orthodox believer, though he did feel there was some sort of life beyond the earthly one. Although he never set out in his anthems to shock or titillate, he could not help adorning them with touches that no other composer would have thought of. The ‘Ave Maria’ of 1894/5 contains a couple of his miraculous returns to standard cadences, as well as some consecutive fifths in the bass that he would surely not have allowed later to his Conservatoire pupils.